capture the entire story of the metal using ultrasonic sound waves. We specialize in Phased Array, Shear Wave, Dissimilar Metals, Thickness, Guided Wave, and AUT Corrosion Mapping. Versa is one of a few companies in the world qualified in dissimilar metals. 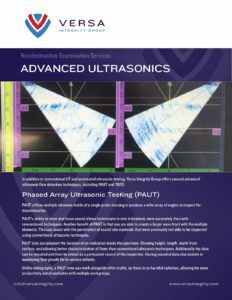 Shear Wave testing is the angular generation of ultrasonic waves to detect flaws or discontinuities at positions, other than parallel, with the sound’s entry surface. We utilize Shear Wave in the inspection of AWS and ASME welds. Versa employs the top ACCP & PCN qualified technicians to perform Shear Wave testing.